What we have here is a small, rather non-descript passerine that has its head turned. Not being able to see the face makes the indentification of this bird rather difficult. On the other hand, if we could see the face the identification would be too easy and not very challenging. The bird looks warm brown on the upperparts and whitish on the underparts. The underparts are possbily very lightly streaked but this is difficult to determine. The back is unstreaked and the wings are plain, lacking obvious wing bars or spotting. The lack of green or yellow in the plumage eliminates many birds, including most flycatchers, warblers, and vireos and all tanagers. The flycatchers, warblers, and vireos that aren't green or yellow are not warm brown on the back and wings like our quiz bird. Wrens are brownish but all wrens have barring or spotting on the wings which our bird lacks. Catharus thrushes have brown or rusty upperparts but all have some spotting on the underparts. Thrashers and pipits have more obvious streaking on the underparts. How about sparrows? Most sparrows could be described as being brown in color but all sparrows, save juncos, have streaking on the upperparts or the underparts. As noted earlier, the upperparts of our quiz bird are unstreaked and the underparts are only very lightly streaked if streaked at all. Icterids are either darker overall (blackbirds), orange or yellow (orioles), or have streaked backs or underparts (meadowlarks and Bobolink). Finches are yellow, red, or green and have streaking or prominent wing bars. So where does that leave us? How about the Passerina buntings? Four species of this genus* occur or have occurred in Illinois and the females and immatures of all four are very plain and non-descript. 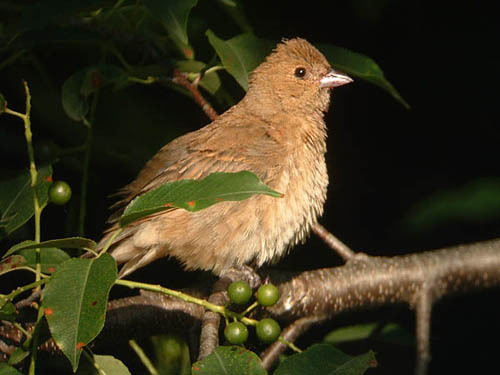 Female and immature Blue Grosbeaks are the same warm brown color as our quiz bird but have conspicuous buffy wingbars. Female and immature Painted Buntings are green overall so clearly this bird can't be a Painted Bunting. 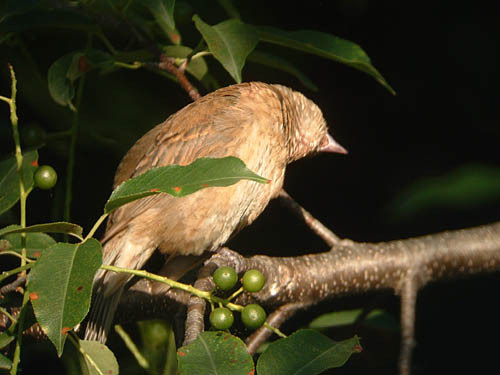 Female and immature Lazuli Buntings have distinct, if narrow, whitish wing bars and a buffy chest that contrasts with a whitish belly. The only other Passerina bunting left is Indigo, and the warm brown upperparts, plain wings, and whitish underparts match the female and immature plumages of this species well. This Indigo Bunting was photographed on July 1, 2004 at an unknown location. *Blue Grosbeak was until very recently in a monotypic genus named Guiraca.